It's no secret I've been making alot of ice cream this summer. What I haven't posted yet is the sauces that go on the ice cream! I'm doing a chocolate sauce first, since that's Dave's favorite. Port is one of these 'acquired taste' things; and we have acquired this taste! We also quickly learned how much better the 20 age ports can be...not to mention expensive! So we stick with a nice 10 year. Our preference is the Taylor Fladgate brand so far but I'm open for suggestions! Port is great in steak sauces, dessert sauced and just by itsel. 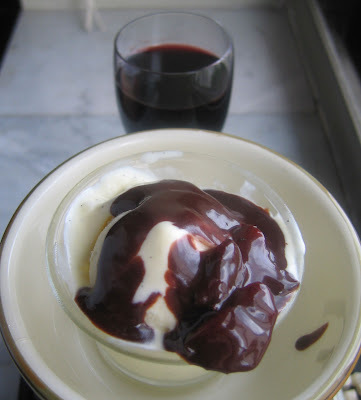 The addition of port, cherries and pomegranate gives this sauce great depth beyond just melted chocolate. (You can omit the pomegranate juice if you prefer or if you just don't have it handy. ) Always keep in mind, I'm not precise in my measurements, so feel free to add a little more or less as you see fit! 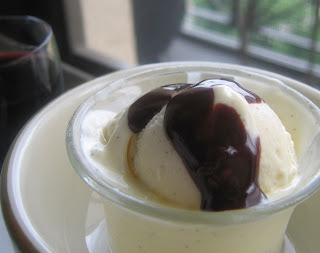 This sauce whips up in minutes and it super fantastic on the Mascarpone Custard -this is a heartier ice cream and it stands up to this sauce. I also enjoyed sipping on a small glass of port with this, but a strong cup of coffee or an espresso would be equally as nice. If you haven't delved into the world of Port's before, pick up a bottle and experiment. You'll be pleasantly surprised with all the uses...along with being fat and happy! Reduce heat, stir until the sugar is melted and the sauce is coming together (about 6 minutes). It should be getting thick.